We give major props to the peeps who bait street-style photogs on a daily basis. While we love dressing to the nines as much as the next gal, sometimes we stare at the closet for what seems like hours, waiting for a Tommy Ton-worthy ensemble to magically appear. Rather than try to out-Anna Dello Russo anyone with an over-the-top outfit, we inevitably reach for one of our beloved Rachel Pally frocks and call it a day. And, although they don't have feathers, bows, or buttons — no other label holds a candle to their unfussy, comfy style. The local line has SoCal style on lockdown with jersey numbers that are second to none. 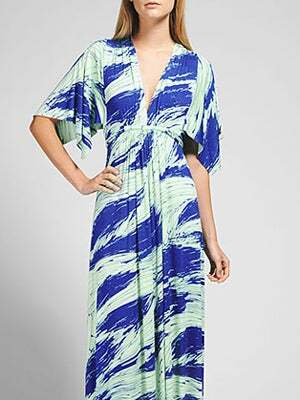 The caftans are our beach besties, while the maxis make picking up lunch so much more chic. Since Pally's pieces are on every L.A. gal's radar, we expect the brand's warehouse sale to be a BFD. With up to 85% off of her signature separates, we won't judge if you come back for a second helping. Just save some of those $10 bikinis for us! When: Friday, July 27, and Saturday, July 28, 10 a.m. to 6 p.m.; Sunday, July 29, 11 a.m. to 4 p.m.
Where: 2301 East 7th Street, Suite C100 (near South Anderson Street); 818-512-9575.